So I'm in this book club. I call it the "Over the Years" book club, but I'm pretty sure I'm the only one who does. Anyway, it's been meeting monthly since 1993, so "over the years" is apt. 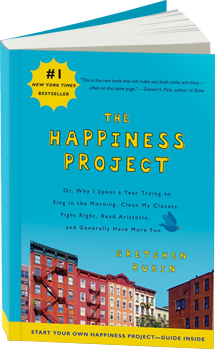 Well the book for July is The Happiness Project by Gretchen Rubin. I put it on hold at the library and it came in pretty quick, so I've just finished it. I was excited to read it because my friend Lindsay mentioned it on her blog, and talked about how Rubin's "Spend out" principle really resonated with her. I just love the photo. This is a well written book. It is organized beautifully. Reading through it, I got the feeling that Gretchen Rubin likes to be organized -- a woman after my own heart! Not only is the book well organized but her thoughts are well articulated within it, and many of the resolutions she made over the course of her year-long happiness project were about becoming more focused on things that matter. I found it fresh and insightful to look at the small things that we can change to make us happy -- those of us who are already happy with our lives, for the most part -- and in that way keep the good that we have and deepen our current happiness. I almost snapped my fingers and said "yes!" several times as I was reading the book. Near the end, Rubin highlights the distinction between resolutions and goals, and that was a particularly enlightening section to me. Goals are set and met. Resolutions are decided upon and you continually strive to meet them. Both are good, of course. Resolutions? Yes please. I will be making some of my own very soon. I've got a nice list of books I want to read, now, too. She keeps recommending them, you see, and making them sound so fascinating. 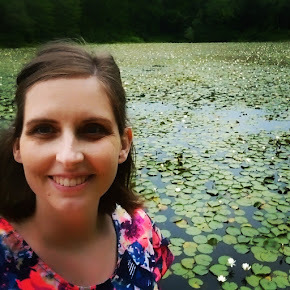 Here's a belated thanks for the blog love! Even though I haven't written about it lately, I still love that book!